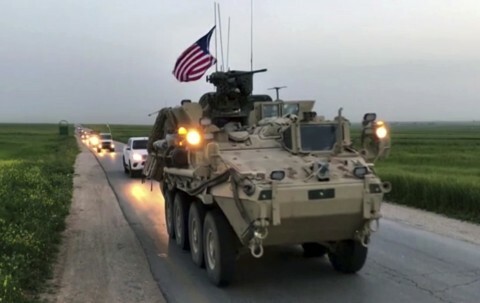 Tensions rose Saturday along the Turkish-Syrian border as both Turkey and the U.S. moved armored vehicles to the region and Turkey’s leader once again demanded that the United States stop supporting the Syrian Kurdish militants there. More U.S. troops were seen Saturday in armored vehicles in Syria in Kurdish areas. Kurdish officials describe U.S. troop movement as “buffer” between them and Turkey. But Turkey views Syria’s Kurdish People’s Protection Units, known as YPG, as a terrorist organization and an extension of the Kurdish militants who have been waging a three-decade-long insurgency against Turkey. “The YPG, and you know who’s supporting them, is attacking us with mortars. But we will make those places their grave, there is no stopping,” President Recep Tayyip Erdogan said. Footage shot Friday night showed a long line of Turkish trucks carrying military vehicles driving to the border area. The private Ihlas news agency IHA reported the convoy was heading to southeastern Sanliurfa province from Kilis in the west. The base is 50 kilometers (30 miles) from Syria’s Tal Abyad, a town controlled by the Kurdish militia. Erdogan hinted his country is also ready to repeat its attacks in Sinjar, Iraq, to prevent it from turning into a base for the Kurdish militia. Kurdish officials said the U.S. patrols are monitoring the Turkish-Syrian border to prevent an increase in tensions with Turkey, a NATO member and U.S. ally. The convoy was followed by another of YPG militia. Some footage posted online showed Kurdish residents cheering American-flagged vehicles as they drove by. U.S. officials say the troop movement is part of its operations with the Kurdish forces in northern Syria. Ankara sent its troops into Syria last August in a military operation triggered in large part by the Kurdish group’s expansion along its borders. The issue has been a source of tension between Ankara and Washington that threatens to hamper the fight against IS. Instead of working with the Syrian Kurds, Turkey is pressing the U.S. to let its army join the campaign for Raqqa, the self-proclaimed capital of IS. Claiming that his country is leading the most effective campaign against IS, Erdogan said: “Let us, huge America, all these coalition powers and Turkey, let us join hands and turn Raqqa to Daesh’s grave,” using the Arabic acronym for IS. The YPG forms the backbone of the U.S-backed Syria Democratic Forces. Redur Khalil, the spokesman for the YPG in Syria, said Turkey is reinforcing its border posts opposite Tal Abyad as well as other border posts.